Displays referenced object in tabular form, it provides compact layout of data in Detail View. The idea of representation an object is borrowed from System.Windows.Forms.PropertyGrid. To fully demonstrate the features, it is required to consider business class with a significant number of properties. 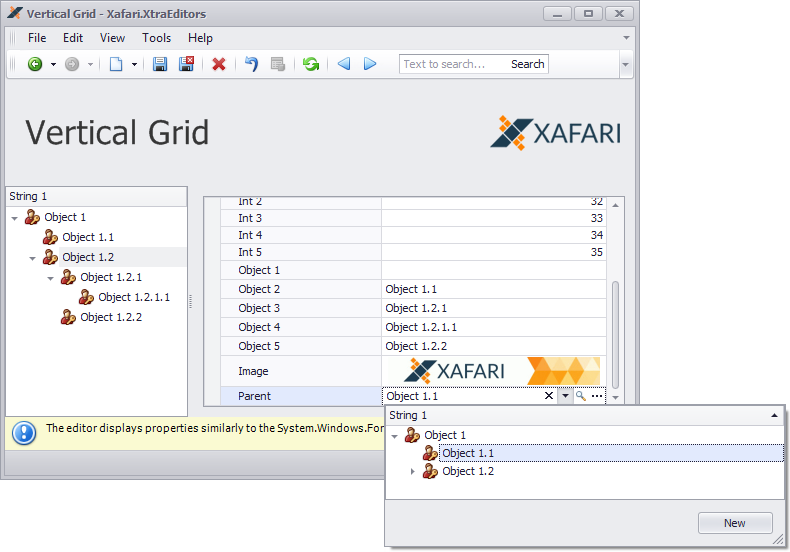 You can use VerticalGridPropertyEditorObject class implemented in the Xafari.XtraEditors.Module | Editors|VerticalGridPropertyEditorObject.cs file of the Xafari XtraEditors demo installed with product. Note ThisObject property that returns an object of the VerticalGridPropertyEditorObject type, i.e. this property represents the entire object. We will apply Vertical Grid Property Editor to this property. Invoke the Model Editor and navigate to the Views node. Add VerticalGridPropertyEditorObject_Properties Detail View and set ModelClass property to the VerticalGridPropertyEditorObject value. Add ThisObject item to the Items node, set PropertyEditorType property to Xafari.Editors.Win.VerticalGridPropertyEditor (or Xafari.Editors.Web.WebVerticalGridPropertyEditor) value, as shown in the image below. 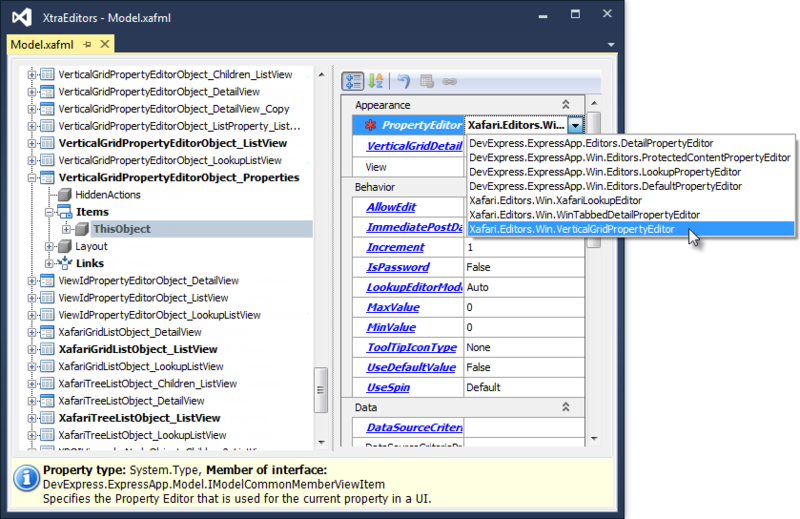 For a demonstration of the Property Editor in Win application, use ListViewAndDetailView displaying mode. 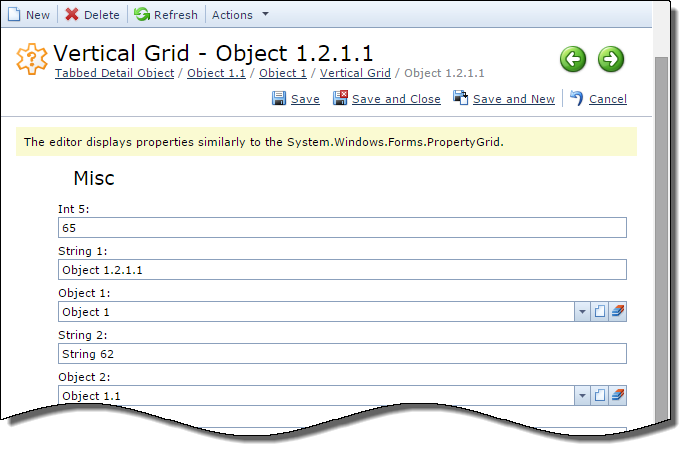 Focus VerticalGridPropertyEditorObject_ListView node, set MasterDetailMode property to the ListViewAndDetailView value and set MasterDetailView property to the VerticalGridPropertyEditorObject_Properties value. Run the WinForms or ASP.NET application and see, what they look like after the changes.